Well the next JAMES BOND film may be on ice, but thankfully we have the video game world to take up the slack. 007 BLOOD STONE is set to release on November 2 on Xbox 360, Playstation 3, PC, and Nintendo DS. 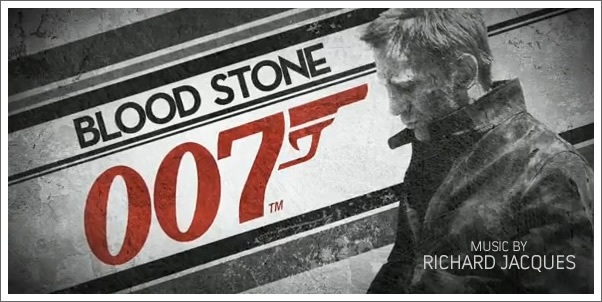 It will feature the voice talents of James Bond, himself - Daniel Craig. Veteran game composer RICHARD JACQUES (Mass Effect, Headhunter, Starship Troopers) steps into the composing-wingtips of John Barry and David Arnold - bringing fans their next musical dose of 007. The score was most appropriately recorded at Abbey Road Studios and the soundtrack features over 2 hours and 20 minutes of music! Check out the official game site for, what appears to be, a taste of Jacques upcoming score and look for more upcoming coverage for 007 BLOOD STONE here at Tracksounds in the upcoming weeks!